Facts about the History of Clothing and regalia of Native American Indians and information about Deerskin. 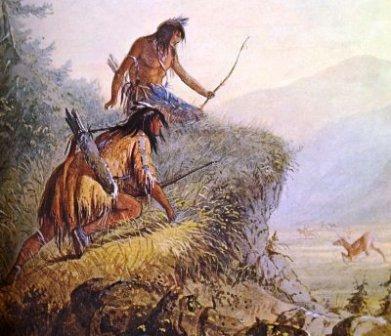 Native Indians hunted deer to provide not only food but also clothing for the people of the tribe. Deerskin was therefore one of the most important elements of Native Indian life. To make deerskin clothing the hide was removed and various processes were applied such as scraping, smoking, softening, stretching, dyeing and decorating the deerskin hide. The quality and use of deerskin was quickly recognised by pioneers, frontiersmen and traders. Trading in deerskin replaced fur trading. A deerskin was worth a dollar to traders and the dollar became referred to as what it was worth - a "buck". The history of traditional or ceremonial dress and regalia worn by Native American Indians is a fascinating subject. The following fact sheet contains interesting facts and information on deerskin.